We are looking for distribution partners in each industrial areas. Please contact us for more information. 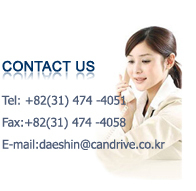 Copyright© 2010 DAESHIN ENGINEERING CO., LTD. All rights reserved.